I first read about the Sips Card in the pages of The Writer and learned shortly thereafter that one of my favorite artists, Kristen Solecki, is on the team behind this ingenious new way of sharing fiction. (Kristen’s art, by the way, graces the cover of To Be Friend a Fox, a volume of poetry by the late Richard Pearce, which I edited in 2010.) Given my interest in spreading the word about new sources of fiction and in Kristen’s work, I was happy to have the chance to chat with the artist about her latest endeavor. What is the Sips Card, and where is it available? 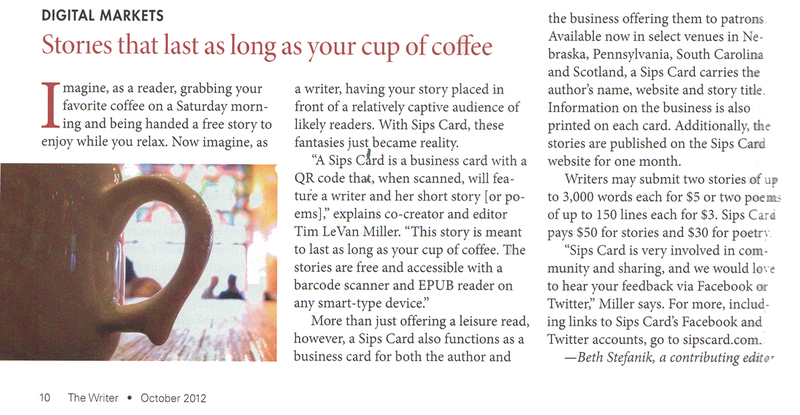 Sips Card is a writing publication that shares the work of independent writers with independent coffee shops. A Sips Card is a business card with a QR Code, that when scanned, downloads a short story or poem onto your cellphone/smart device that is meant to last as long as your cup of coffee. They are available in participating coffee shops around the country, and in Scotland. You can see our current locations at http://www.sipscard.com/venues. If you are interested in becoming a venue or would like to recommend one, please email us at sipscard@gmail.com. It was a cold day in December and we were reading on a couch, trying to stay warm. Tim was explaining to me the idea of using QR Codes to market my artwork. We then were talking about sharing other media through the codes and we somehow connected the thought of reading, QR Codes, and coffee shops and spent the next two months developing the idea into what it is today. Is there a way for readers to ask their favorite coffee shops to carry the Sips Card? In other words, how can we help spread the word? Most definitely. We love hearing about favorite coffee shops from our readers and writers and want to support venues who support their community. There is no cost to the coffee shops or the customers. Once a shop is on board, we ship them the current issue with a compact display stand they can use as they wish. We create a page for them on our website and then ship each new issue as it is published. Can you tell me a little bit about the works you’ve published in your first year? What was it about these stories that jumped out at you and made you want to publish them? Along similar lines, do you have any advice for writers who might want to submit their work for publication? We’ve published a wide variety of stories and poems in our first year. We are open to all types of general fiction that has strong characters and appeals to a variety of people. We look for work that breathes with a life of its own and prefer narrative poems because we feel they compliment short fiction best. However, we don’t only publish narrative poetry. A well crafted story, with great character tension, along with a professional looking submission will grab our attention. We want to know that the submitting writers and poets care as much about their work they are submitting as we do about the work we publish. Thanks, Kristen for the opportunity to chat about the Sips Card. It’s a great idea, and I hope it continues to gain in popularity! As its title suggests, Traci Law’s gorgeous new book of photography, Enchanted Britain: A Photographic Journey, takes readers on a magical tour of the land that brought us such wonders as The Lord of the Rings and Harry Potter. I recently had a chance to chat with Traci about the book and the magical (yet real!) landmarks that she captures in its pages. What drew you to Britain for this project? I have always been drawn to the myths and beauty of Britain. At the risk of sounding cliché, there’s just something very magical about it with all the castle ruins scattered about, the ancient and medieval buildings and the scenery. Over the years I’ve built up a vast collection of images from Scotland, England and Wales and wanted a way to share them with people beyond art shows. In producing the prints for this book, you used a process called HDR or High Dynamic Range imaging, which gives each photograph the appearance of a painting or a dreamscape. What was behind this decision, and what was involved in the process? HDR is a process that some photographers love and some photographers loathe. It’s definitely a different look from what we’re used to seeing in photographs. Sometimes it works and sometimes it doesn’t. For Enchanted Britain there were many images that this process simply did not work well. However, I decided to use all HDR images to continue with the idea of the magic and enchantment of Britain. Personally, I love the look it gives. For some images, like Kilchurn Castle in Scotland, it gives a softer feel whereas for other images, such as the Chapter House stairs in Wells Cathedral, it gives an eerie, mysterious look. On average it can take twenty minutes to nearly an hour per image to get the look just right. I use three different programs to achieve the perfect look for the subject and image. Of course, it is important to have a good original image to start with. HDR can change a look but it can’t perform miracles. In your “other lives,” you’ve worked on archaeological digs and have been the host of Morbid Curiosity TV, a web series exploring the relationship between history and paranormal phenomena. How did your other interests influence your work on Enchanted Britain? It was through archaeology that I was accepted to work on a project at the Wiltshire Heritage Museum in England and it was there that I was able to explore more of the true England and appreciate their history on my own. I’ve always been interested in history and the medieval period so everything managed to fall into place nicely. A few years later I went back and drove around the United Kingdom without really having a plan other than to photograph anything and everything. Some of the places I visited I had heard of from my days in the paranormal field, such as Rosslyn Chapel, but it was their history that drew me to visit. I suppose, ultimately, it was my deep appreciation of history and respect of people and places that really influenced the images I chose for the book as well as influences how I see things when photographing in general. Thanks, Traci, for an enchanting conversation! In the Fall of 1991, I received a phone call in response to a promotional mailing I had sent to publishers advertising my studio’s book jacket designs. The promotion was unique in that it was quite small, only 3 ½ by 5 inches and arrived in a hand-addressed envelope. This gave it the look and feel of a personal invitation, not another mailer from an art studio. As I write this in 2012, printed mailings and telephone inquiries seem quaint but were a very human way to make contact with a prospective client. Someone had to take the time to open the envelope, hold something in their hand, read some copy and then, if you did it right, make a phone call and have a conversation. Aside from the conversation, this is much the same way a well-designed book jacket should work. Something sparks your interest, you pick it up, read some back or flap copy and, if the package is right, you’re hooked. The Permanent Press, a small independent publisher of quality fiction. their work. He published what he and Judy would want to read. 3. Independent publishers do not have deep pockets. For some designers, point 3 could have been a problem, but we agreed to give it a try due to the fact that the print schedule of the press would allow me to work on several covers at a time, but the most exciting part of this venture would be the working relationship I would have with The Permanent Press. There was Marty, and there was me. No account guy, no marketing guy, no focus group guy. It was just us two guys. This could be a dream client. 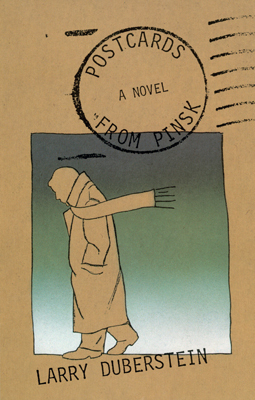 My first assignment was Postcards from Pinsk by Larry Duberstein. I read the manuscript, got to work and turned in my cover concept. Marty loved it. All was right with the world. 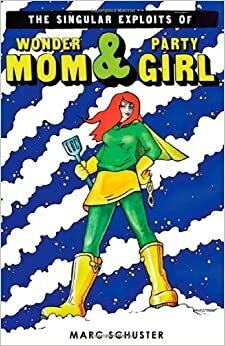 It was Larry, “The character on the cover is too fat. Can we slim him down”? The point of this is that although my ultimate approvals come from the publisher, I as a cover designer have become very aware of the author and their feelings of wanting to be involved. Marty and I have developed a policy that works like this: “We welcome your suggestions and will always listen to them but we make no promises.” This sometimes proves difficult for an author. They have worked tirelessly on a book and have a unique and emotional relationship with it, they feel they know exactly how the cover should look. 20 years and well over 120 covers, I still haven’t fully decided. I can’t say that I have ever taken an author’s suggestion and created a cover based solely upon it. What I can say is that if you stop and listen, you may get a better understanding of the author’s intent even if the graphic representation presented may not be quite right. 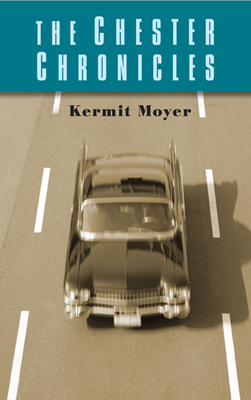 This brings to mind a wonderful book, The Chester Chronicles by Kermit Moyer. 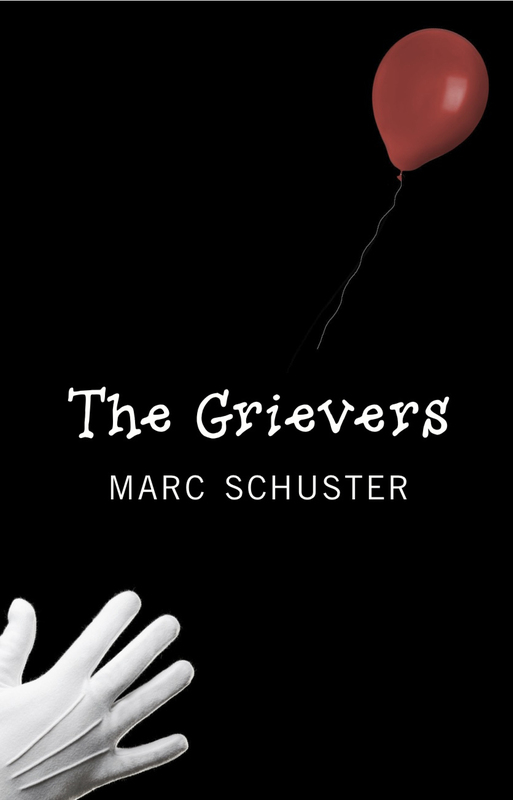 The story of Chester’s life is told by stringing together a series of short stories. Individually, each story can stand on its own, but together they become a life. A life that is dominated by the relationship between a boy and his father. Kermit did not make any initial suggestions for a cover design. The original concepts I created were not quite right. They just didn’t do the book justice. After several emails with the author I began to get a better understanding of where we should be going. The final cover, an image of a vintage car heading down the road has a nostalgic overall feeling. The cover reflects the power of the father figure and also serves as a subliminal reminder that life is a road that must be travelled. Combined with some retouching, a typographic treatment and color scheme, it became the complete package. When I found this image, I knew it was going to be the cover due to my contact with Kermit. When Kermit saw the final design he was thrilled, it was everything he wanted the cover to be. Many times an author will make one little suggestion that in fact helps elevate the cover and gives it an extra push. 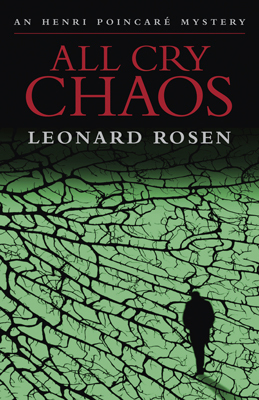 A suggestion by the brilliant Leonard Rosen to include a figure of his protagonist on the cover of All Cry Chaos was something that both Marty and I resisted. We felt it would confuse the bizarre cover image but in the end, the addition of that figure in such a strange landscape set the stage beautifully for the first Henri Poincaré mystery thriller. There is nothing more satisfying than having an author tell me that the cover is perfect. It is what I strive for. As a cover designer, I get one chance to state my case as opposed to an author who gets to build his case page after page. Most of the covers I produce do not have the input of the author. I read each manuscript as I find it very hard to grasp a book wholly by reading several pages of a synopsis (unless that is all that is available). I have been asked many times if it is worth the time and effort. My answer to this question is that more than once the idea for the cover has come on page 209 of a 211 page manuscript. This is not to say that I choose to illustrate a particular moment in the story, it is more likely that something in the text sets off an idea that in the end becomes the basis for the cover. The world of publishing is constantly changing. Internet shopping and digital delivery present new challenges to authors, designers and publishers, but in the end, no matter what the form, a book is still a book—an idea pieced together with words from an author’s unique idea. In much the same way a cover is still a cover—a package to present that unique idea whether it be printed on paper or illuminated on an e-reader. Lon Kirschner is a graphic designer who has designed logos, packaging, film posters and of course book jackets. You can see more of his work at www.kirschnercaroff.com. As Elli Crocker’s Sheepish (left) might suggest, the latest issue of Wild Apples is not just an homage to the creatures with whom we share our world; it’s also a colorful exploration of our relationship with those creatures, an examination of the ways in which the lines between ourselves and other members of the animal kingdom might not always be so clear. The journal itself is lavishly illustrated with a wide range of paintings, drawings, and photographs, and the essays and poems that appear throughout are both inspiring and thought-provoking. 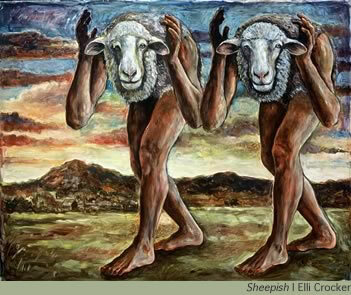 Of particular interest is an essay titled “The Animals Within Us” by Greg Lowenberg. In this piece, Lowenberg, the Director of Education for the Coastal Maine Botanical Gardens in Boothbay, Maine, builds upon Edward O. Wilson’s concept of biophilia (the theory that humans unconsciously seek connections with the rest of life) to argue that the microbes and parasites we hold in common with other organisms underscore the extent to which we have all participated in the same intricate process of evolution. These microbes and parasites, according to Lowenberg, include “organisms that came from elsewhere but live within us, with full time jobs performing essential functions as digestion, disease and infection prevention, and tissue repair.” What’s more, Lowenberg argues, the fact that we share this condition with many other organisms means that we are not alone — and that we are not so different from other species as we might like to imagine. Also of interest (among the many insightful essays and poems in the collection) is Katherine Leibowitz’s “Out of Our Skins: of Flux and Flame,” which offers a survey of myths, legends, and works of literature in which humans have taken animal form (and vice versa) throughout the ages. What emerges throughout this essay is that such tales are common to all cultures — a fact that echoes Lowenberg’s point that (other) animals are more central to the human identity than we tend to let on. We see ourselves in animals, both essays seem to imply, not so much because they are so human, but because we are, at the end of the day, animals ourselves. As these two examples suggest, Wild Apples does a wonderful job of combining disciplines. Art, literature, history, and science all work together to complement each other beautifully and effectively in this colorful 48-page volume. Highly recommended (as the journal’s tag line suggests) for lovers of nature, art, and inquiry — and, if I might add my own two cents, for lovers of good writing as well.